A barking dog can be a nuisance or a life saver; it just depends on the situation. We all know that dogs bark to communicate, but understanding what your dog is trying to communicate will help alleviate excessive barking while allowing your dog to be a dog. Dogs bark at things outside your home for two general reason. Your dog is either alerting you, the pack leader, that a stranger has entered your pack’s territory, or your dog wants to play with whoever or whatever is outside your home. Despite how frustrating it is to hear incessant barking, yelling at the dog will not help. 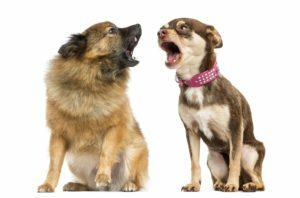 In fact, yelling will have the opposite effect because your dog likely thinks you are joining in and doing some of your own kind of barking. This reinforces the barking, giving the opposite effect and prolonging the problem. Instead, you want to make sure the dog isn’t being aggressive and hasn’t acted aggressively in the past. If your dog is aggressive, then your barking problem needs to be handled by a professional. With a dog that’s not aggressive, there are steps you can take to eliminate excessive barking. When your dog barks at something outside, go to the window and check. This is often enough to stifle a dog’s barking. The pack leader has checked it out and isn’t barking, and the dog is likely to follow suit. If the dog continues barking, give a firm, calm and assertive “quiet” command. If the dog stops barking for a few seconds, praise and reward him. Ñ Block the dog’s access to the window by putting yourself between the dog and the view. Give the “quiet” command again and step toward the dog. Continue until the dog stops barking for a few seconds. Then praise and reward. Ñ Shake a can of pennies to get the dog’s attention and say “quiet.” Once the dog stops barking for a few second, praise and reward. Ñ Use a water spray bottle to get the dogs attention, and again say “quiet.” Praise and reward if the dog complies. To support this training, make sure your dog gets enough exercise, which will relieve stress and make the dog less likely to alert for no reason. Dogs need two 20 to 30 minute walks each day, though many dogs do not get that much exercise. You can also teach the dog the “come” command, and when the barking starts, simply call the dog away from the window. If all else fails, contact a professional dog trainer. Remember, your dog barks to communicate, so learn what the dog is trying to say and use it to end excessive barking.